Updated Wednesday April 4, 2018 by Nashua Cal Ripken. 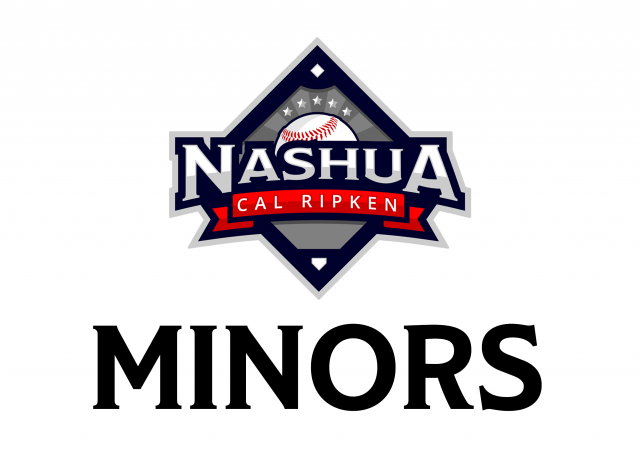 Minors is the first level of player-pitched baseball in Nashua Cal Ripken. Minors is played on a 60’ base path and 46’ pitcher’s mound distance. The majority of the players in Minors will be 8 or 9-years-old. Experienced 6-year-olds may be on Minors teams if they meet all requirements. Any player that doesn't meet the requirements to play in Minors, may request to be reassigned to Rookies for another season. In Minors, coaches emphasize the advancement of players’ baseball skills. Players are taught to apply those skills and make their own decisions in live game situations. Minors introduces live pitching from the players, as well as a hard baseball. Toward the end of the season base stealing and bunting is introduced. Minors is meant to prepare players for their introduction to competitive baseball in AAA. Ability to hit a baseball pitched on a flat line (not lobbed). Ability to catch and throw a ball on a flat line. Players should not be afraid to catch a baseball or to have a ball pitched at them. Players with little or no prior experience, or who don’t meet the developmental guidelines for Minors, should remain in Rookies. Most children play in Minors for two years prior to entering AAA. Parents of 10-year-olds with little experience and who don't meet the developmental guidelines for AAA may request their children play in Minors. Nashua Cal Ripken forms teams with the purpose of ensuring an enjoyable experience for players. We use information such as players’ schools, and coach or teammate requests when forming teams. We cannot guarantee we will be able to honor all requests. Games last a maximum of six innings or 90 minutes. Teams observe continuous batting; the batting order includes all players on the team. Players may be called out on strikes and half-innings end after three outs. To develop hitting and fielding skills, at certain times batters will continue to hit from a coach pitcher after being walked by a player pitcher. Players are rotated through infield and outfield positions, although coaches may consider safety in assigning positions. Ten defensive players take the field during each half-inning. Players share equal playing time and will sit out innings, but no player shall sit out two consecutive innings. Catchers are positioned behind home plate and catch “live” pitches. Coaches umpire in Minors games. Game scores and records are not kept. Teams will typically have 1 practice and 1-2 games each week. The season, which begins in late April and ends in late June, includes approximately 12 games.